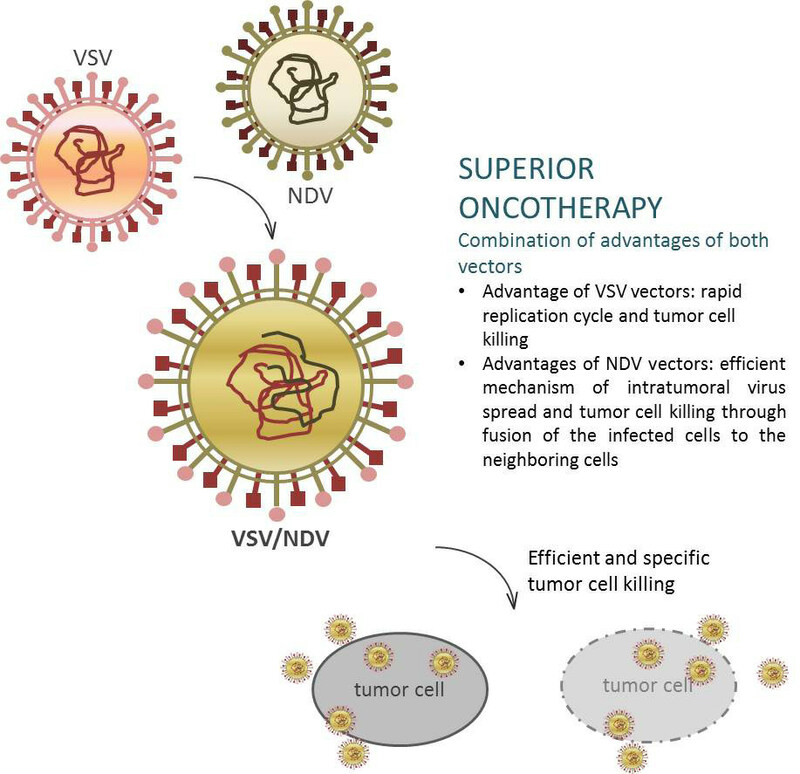 Oncolytic virotherapy for cancer has emerged as a novel and promising therapeutic approach to replace standard cancer therapies, which often provide limited efficacy at the cost of unpleasant or severe side effects. Oncolytic viruses have either an inherent ability to selectively kill cancer cells or are genetically engineered to preferentially replicate in cancer cells. Although several therapeutic virus platforms have recently found their way into the clinic, the widespread use of oncolytic virotherapy has been greatly limited by several challenges, including safety concerns. Thus, there is an urgent need to develop a new generation of oncolytic vectors to overcome the hurdles and exploit the therapeutic potential of virotherapy. Here, a novel VSV/NDV hybrid virus was engineered that combines the advantages of both vesicular stomatitis virus (VSV) and Newcastle disease virus (NDV) vectors, while the safety concerns of both are eliminated. Although VSV vectors are known for their rapid replication cycle and tumor cell killing, neurotoxic effects at elevated doses have hampered their clinical development. NDV vectors cause no dose limiting toxicities in humans, and mediate an efficient mechanism of intratumoral virus spread and tumor cell killing through fusion of the infected cells to the neighboring cells; however, the clinical development of NDV as an oncolytic vector has been restricted due to the environmental risk for birds and the poultry industry, as NDV is a natural avian pathogen. The VSV/NDV hybrid virus effectively overcomes the safety concerns of each parental virus, while maintaining efficient tumor cell killing. Furthermore, the inclusion of a modified fusion protein allows the hybrid virus to mediate fusion of infected tumor cells to neighboring tumor cells, thereby inducing rapid immunogenic cell death, bypassing the need for high levels of virus replication. Oncolytic virotherapy has many advantages compared to the conventional treatment options, such as chemotherapy and radiotherapy. It is expected that oncolytic therapy reduces severe side effects and efficiently eliminates tumor cells through its dual mechanism of action: On the one hand tumor cells are directly lysed by viral infection, and on the other hand, the virus can induce an immune response against the tumor to result in long-lasting systemic immunity. Proof-of-concept in vitro. In vivo experiments are currently being performed.